Notes: A captain's skiff was a type of small craft, about the size of a runabout, attached to Starfleet Luna-class starships in the late-24th century. Similar to Galaxy-class and Sovereign-class captain's yachts the skiff was launched directly from the underside of the saucer section, from just behind the ventral sensor array. 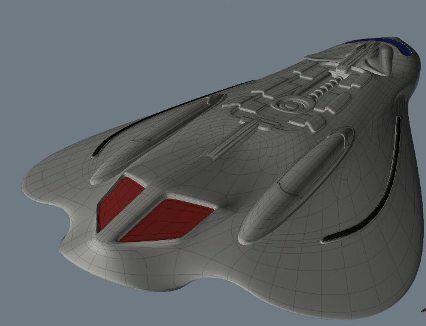 Captain's skiffs were warp capable, and designed for diplomatic functions and recreation; they were not typically suited for missions requiring a powerful ship. Captain's skiff systems included a transporter.